A lot of people requested us to come up with a list of best washing machines under 10000 in India 2019, so here we are. We have selected the best washing machines available online based on the build quality, motor's power, and RPM and capacity. After sales service is also an important factor as washing machines do face problems after a couple of years of use. Semi-automatic washing machines from brands like Whirlpool, Godrej, Panasonic, LG, Samsung, and MarQ have been selected in this list. Whirlpool is a big brand so its washing machines are priced above the others. Both semi and fully automatic top load washing machines launched in India in January 2019 or before are listed here. All the washing machines on this list have great performance. You will see that the capacity of these washing machines is around 6 to 7 Kg which is suitable for small families. The RPM of motors of most of the washing machines is between 300 and 400 which is really good. These machines are priced under 10000 if you can extend your budget to around 12000 then take a look at our list of best washing machines under 12000. Links to Flipkart and Amazon have been provided for every washing machine. You will also see a brief description of every washing machine with its specifications and pros cons. Prices are also provided for every washing machine but the prices keep changing every day so please check the latest price by clicking on links provided. So let's take a look at the 10 best semi and fully automatic top load washing machines under 10000. Midea has a very competitive pricing which goes the same with the Semi automatic washing machine from Midea. This is a 6.5 Kg machine which comes with a decent motor of 1350 rpm. It is a suitable option if you are a group of friends or a small family with 2-3 people. The build quality is also decent and the ABS(plastic) material looks of a good quality. It has similar control as in other machines - Wash, spin and the middle selection switch. The machine cleans cloth properly with no issues as it comes with an Aqua Crest Pulsator that rotates and twists the cloth perfectly for all the dirt to be removed. Also as seen in the other washing machine, there is a lint filter which can be detached and clean at the end of washing. Overall, this is a good semi-automatic washing machine to consider for a pricing of only 6999 and it works perfectly well. The price is also economical because of not a big brand name but to our surprise, the service from Midea is also super quick. The machine comes with a 2 Years warranty and is available in 2 colours. You can check the other colour here. Midea is a new player in the washing machine segment but has made a mark early on because of the strong price point they offer with the quality. This Midea washing machine is a Fully automatic top load washing machine which had a capacity of 6.5 Kg. Considering the capacity, this machine is suitable for family with 2-3 members. On the build quality side, the body is of stainless steel and is strong. In features, there are 8 different wash programs available which allow you to choose the type of wash based on the type of cloth and how dirty they are. The motor has an rpm of 700 which is powerful for a 6.5Kg machine. So for using it, mostly you will be using the smart touch feature, which itself determines the amount of water, the number of wash and spin cycles as you would expect from any Fully automatic washing machine. In case the clothes are less or are not very dirty, you can use the Fast clean feature. It also has a Hexa Frill Fresh which can be used when the clothes are very dirty as it works in the full power mode while not consuming a lot of water to clean the dirt from clothes. It comes with a new memory feature where it restarts from the previous timer and wash setting in case the power goes off in between. This Midea washing machine is also able to operate at very minimum water pressure as well, so you will be able to wash the clothes anytime during the day or night. This machine is the most economical(at under 11000) in terms of capacity and quality is offers and is a good value for money. It comes with 2 years warranty from the manufacturer. MarQ is Flipkart's own brand for electronics. This is one of the cheapest 8.5 kg semi-automatic washing machine with no compromises. Similar capacity washing machines from other big brands will cost you 3000-4000 more. So if you are on a tight budget and don't have brand preferences, this might be a good option. The washing machine is made of good quality materials and feels durable. The machine looks very nice because of the top translucent lids. The control buttons on the top also feel solid. It is crafted from high-quality ABS material which makes it rust-resistant and moisture-resistant. There are 3 wash programs available. The Normal wash program is good for regular clothes, the Strong wash program is great for washing bed linens and the hard laundry and the Gentle wash program is for washing delicate laundry like wool. The motor is powerful at around 400 watts and the RPM is 1450 which is an excellent number. Go for it if you need a big 8.5 Kg washing machine at under Rs. 10000. Mitashi MiFAWM62v20 is one of the most economical options for a fully automatic top load washing machine. It has a capacity of 5.8 Kg which is suitable for a family of 3 people. It is compact and can easily fit into the bathroom and is easy to move from one place to another. On the features side, it comes with an Intelligent Hall Sensor that checks the weights of clothes in the tub and adjusts the amount of water and the type of wash, duration of wash and rinse that should be performed. It also has a soak function that allows keeping the dirty clothes dipped in water for sometime before they are actually washed. The washing tub and machine is designed in a way that the clothes are not harmed in any wash and has a digital display to indicate the time left for the current wash cycle and the wash program that is currently running. The tub has the rpm (revolution per minute) of 600 which is not the best but decent given the price of under 12000. The body is made of stainless steel that can easily handle high spinning speeds and the body is durable. Mitashi 5.8 Kg Fully Automatic Top load washing machine comes with 2 years of warranty on the complete product and 5 years on the motor. Samsung is one of the best brands in India and competes with LG directly and both of the brands have similar pricing which is little more than other smaller brands. Similar is the story with this semi-automatic top load washing machine, the build quality is solid and the motor is powerful. The after sales service network of Samsung is strong so you won't face any issues with that. The design of this washing machine is nice and different. Instead of translucent lids on top, Samsung has used trays. Samsung calls it EZ Wash tray. EZ Wash Tray feature offers you versatility and convenience while washing clothes. Thanks to this tray, you can easily scrub, rinse and handle multiple laundry tasks with ease. The knobs on the top of the washing machine have a stylish design instead of the boring circular design. You can use them to select wash or spin tub time, type of wash and to drain water. The washing machine has big wheels at the bottom and handles on the body which helps to move the machine easily. The washing machine comes with Double Storm feature. It is a powerful dual jet system that uses horizontal and vertical currents of water to move the clothes around the drum. It helps to improve the quality of wash plus your clothes stay untangled as well. The washing machine also has a soak feature. It lets you soak your laundry right in the washer itself before you start the wash cycle. Not only that you can also set the soaking time. The spin tub has Air Turbo Drying System which circulates air to remove as much moisture as possible from heavy clothes like jeans, bedsheets etc. Overall, this is a great looking machine under 10000 with all types of features you can expect on a semi-automatic machine. Plus, you get the brand name of Samsung and their after sales service is one of the best. LG is one of the best brands in India with massive after sales service network and that's why their products are little overpriced than others. This is a well-built washing machine from LG. The body is strong and durable. The washer is on the left and dryer is on the right side. There are 4 control knobs on the top to select wash type, wash time, drain water and select spin time. There are 3 wash programs available for different type of clothes. You can use the gentle programme for delicate clothes, the normal programme for clothes that you wear usually and the heavy wash programme is good for extremely dirty clothes. This semi-automatic machine comes with a 360 W motor which runs at an RPM of 1000. The machine works on roller jet pulsator washing method. In Roller Jet Pulsator technology, the rollers of the pulsator cause added friction among your clothes. This helps in the removal of dust and stains from each and every corner of your clothes. The washing machine comes with a 2-year onsite warranty from LG. LG has one of the best after-sales service networks across India so you won't face any issues while availing the service. Overall, it is a great washing machine from LG and one of our favorite semi-automatic washing machines under Rs. 10000 category. Panasonic is not really known for selling washing machines but this one is a very good product from Panasonic. It is one of the best selling washing machines on Flipkart with over 6000 ratings. The build quality is decent and it has a nice floral design on the front which looks beautiful. The top lids are translucent and are in red color. Panasonic has used red and white colors really nicely on this washing machine. The wash controls, timer, buzzer and water inlet are on the top side. The knobs on the top have a chrome finish. This semi-automatic washing machine comes with an Auto Soak option to let you soak your clothes before starting the wash cycle. There are 2 wash programs which allow you to wash clothes in different stages for a better wash. The machine provides a thorough cleaning and dryer works well as well. Overall, it is a nice washing machine under 7000 to 10000 Rs in India. Whirlpool is the top notch brand in the electronics appliances and washing machine is one of them. The build quality is the best with no compromises. It has a stylish design and a large tub that can handle a lot of clothes and support easy movement so that they are cleaned properly. Its top control panel which selects the wash programs and timer for tub and spin is waterproof so in the case where the water accidentally falls over it, the panel will not be damaged. Also, the control nobs are of very good quality and sturdy to use indicating a long life. In terms of performance, it has a very powerful motor of 340 W which powerfully rotates the clothes and cleans them perfectly. The wash tub has an impeller fitted that assists in the proper motion and cleaning of the tub.T he drier tub has a high rpm of 1400 which ensures super drying in no time. It comes with a smart scrub station where you can easily scrub each of your cloth before putting it to wash and the design allows you to utilize the same water and detergent back into the tub reutilizing the detergent and water and leading to less wastage. Overall this, Whirlpool 6.2 kg semi-automatic top load washing machine is one of the best semi-automatic washing machines under 10000. You can also check here the 7.5 Kg variant if you have a bigger family or have a lot of clothes to wash.
Godrej is a well-known brand across India. They make high-quality products and offer good after-sales service as well. 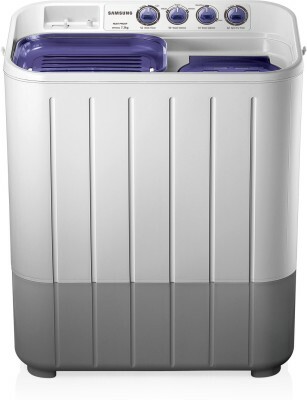 This is a semi-automatic washing machine from Godrej with a capacity of 6.2 kg. This capacity is suitable for a family of 3-4 members. As you would expect from Godrej, the build quality is great but the design is very plain. There is no design at all. The front is plain white and there is some color on the lids which are translucent as well. All the controls are provided on the top in various knobs. The machine runs with a 350 Watts motor at an RPM of 1000. Both specs are decent for a semi-automatic washing machine in this range. There are 2 wash programs available which should be used depending on the type of clothes load you have. The washing machine works on optima force method which provides a great wash no matter how dirty are your clothes. Go for it if you like Godrej brand and need a washing machine under 10000. Whirlpool Ace 7.0 Supreme comes in a new design and a solid body. It is rustproof and very durable. With its capacity of 7 Kg, it is suitable for a family fo 3-4 family members. This would also depend on the frequency of your cleaning cycle and the number of clothes you have to wash. If you have a lot of clothes then you should look for a higher capacity washing machine. This semi-automatic washing machine has a very powerful motor that rotates the clothes very effectively to clean the clothes in the best possible manner. It uses the impeller technology that controls the movement of the tub. In terms of features, it has 3 wash programs and the spin tub has a very high rpm of 1400 which indicates that it can dry the clothes very quickly. The build quality is of a high standard and easily able to withstand a lot of shaking at the time of drying. Whirlpool offers one of the best services after sales and this washing machine comes with 2 years of warranty. If you need a semi-automatic washing machine under 10000 then this is a good option from Whirlpool. So this was our list of top 10 best washing machines under 10000 in India 2019. We hope the list was helpful and you were able to find a new top load semi or fully automatic washing machine for your home.